Mr. & Mrs. Nathan & Elaina J. at the DAR, NW, WDC. Congratulations on your upcoming nuptials! #YouAreEngaged! The wonderful and talented staff of busy bees at Tiered & Petite are super excited to assist you in scheduling an appointment to experience our utterly delicious custom cake flavors. The unique, sentimental and special details of your wedding can inspire us to create a true masterpiece personalized to capture your style, vision and personality. Our one hour consultation, tasting and design sessions are primarily scheduled Thursdays between 5pm to 7pm in Hyattsville, MD. Since we dedicate our weekends to delivering and assembling cakes at the venues, we are not normally able to receive appointments on Saturdays and Sundays. These sessions are charged for. CLICK HERE for our menu and cake tasting information. Your cake will look fab, taste delish and be a true work of art displayed for your guests enjoyment. You deserve the absolute best so we use ONLY THE FINEST all-natural 82% European style butter, award-winning imported chocolates, superior cream and Madagascar Bourbon vanilla beans. Next to the two of you, we will ensure your wedding cake to be the belle of the ball. 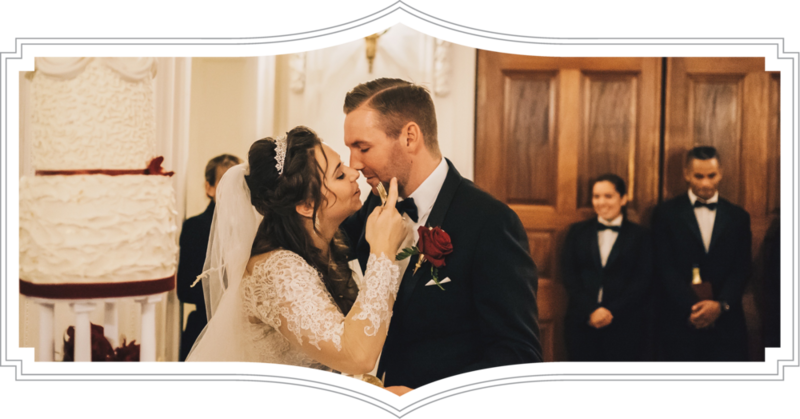 So let’s talk all things weddings! Our wedding cake prices start at $6 per serving for our creamy delicious Italian meringue buttercream cakes and $7 per serving for our luxurious house-made white chocolate fondant cakes. CLICK HERE to schedule your private consultation or contact us at Cotton@TieredandPetite.com. Planned social occasions (AKA Events) come in all shapes and sizes: Corporate Soirees, Galas, Grand Openings, Fundraisers, Birthdays, Anniversaries, Retirements. Whichever event you are hosting, we will collab with you to create a beautiful, unique and delicious custom cake. 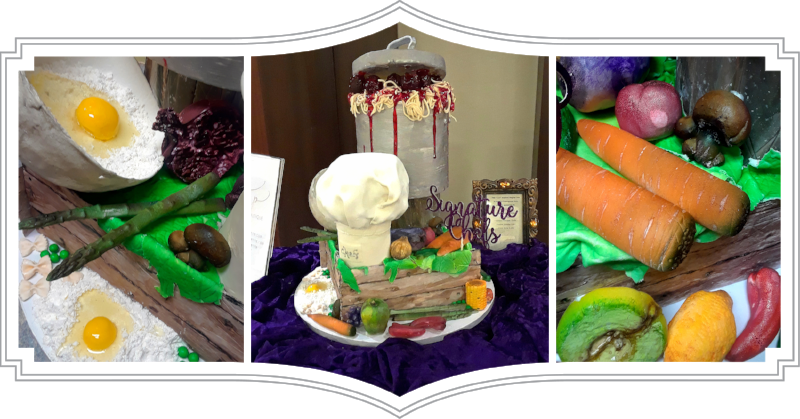 Your event’s theme will take center stage through your edible work of art. As we work together to solidify your concept, we encourage you to gather cake flavor and design inspiration from aspects of your theme, your invitation and personal taste. When selecting your cake flavors, be mindful of your guests who are expecting to be wowed by the taste and creativity of your centerpiece cake. We suggest you choose flavors that are familiar in tradition, a little nostalgia from your childhood and a chic, sophisticated cake flavor that captures your events posh side. Your centerpiece cake could shine ever brighter alongside a tower of our 3”tall gourmet cupcakes. Cupcakes are not passé so let’s doll these little beauties up with fresh fruit, 23-karat edible gold, fresh house made fruit fillings, ganache’s and pastry cream mousseline. Tiered cake: Check! … Cupcakes: Check! … Dessert table: Check! Let’s get started designing your event’s masterpiece. Our tiered cake prices start at $6 per serving for our buttercream cakes and $7 per serving for our house made white chocolate fondant cakes. CLICK HERE to view our menu and gourmet cake collections. CLICK HERE to schedule your private consultation or contact us at Cotton@TieredandPetite.com. Chef Inspired Centerpiece Cake for the March of Dimes’ Signature Chef Auction at the Marriott Marquis, NW, WDC. The infamous Dessert Table is a stunner that attracts the most discerning palates. “Sweet tooth’s” far and wide will swarm like honey bees to get a nibble of its sweet nectar. Your gorgeous dessert display will be adorned with bite-sized fudgy decadent Whiskey Bourbon caramel brownies, delicious browned-butter chocolate chip soft-baked cookies, creamy bourbon banana pudding shooters, warm sticky challah bread pudding with bourbon whisky sauce, hand-cut exquisite moist almond raspberry petits fours dipped in our luxurious award-winning white chocolate. Whatever else you sweet little heart desires. Dessert Tables have graced the presence of many events including: Mother’s Day Tea Parties, Little Princess’s Wood Fairy Garden Tea Parties, Breakfast at Tiffany’s Bridal Showers, My Little Prince’s Royal Baby Showers and Bold & Beautiful Beauty Salon Grand Openings. A chic display of petite desserts are an eloquent answer to the perfect planners question: “How to deliver a plethora of sweets in all shapes, sizes and colors in a stylish upscale manner?” #Voila! Tiered & Petite specializes in TIERED centerpiece cakes and PETITE desserts (hence our name! #Yay!). Upon arrival to your venue, the magic of creating your decadent table display of tantalizing desserts begins. This service is our Dessert Table Styling Package which includes: a dessert table linen to coordinate your event theme, a personalized framed dessert menu, event inspired dessert table floral centerpieces and décor, disposable napkins and plates, porcelain and crystal risers/plates/pedestals and the necessary equipment we need to keep your warm desserts warm. The possibilities are endless! Let us (and your sweet tooth) design a display that you dessert - Oops! We mean “deserve”! Our Dessert Table Styling package starts at $100. CLICK HERE to get a quote on your upcoming event or contact us at Cotton@TieredandPetite.com so we can collab. To view our dessert table menu and pricing, please CLICK HERE. Miss Leigh’s 17th Birthday Dessert Table at her residence in West Lanham Hills, MD. Connoisseur of Fine Mini Cake Flavors # Epicure! What makes a cupcake (or any food) “gourmet”? Welp, simply put: “Gourmet” indicates the product you are purchasing has been made in small batches, with extreme care and attention to detail, using only THE finest of high quality (in our case) ingredients. Cupcakes can be super fun and whimsical for your little one’s 1st birthday party; they can be sporty, rough and rugged for his “wings & things” superbowl party; or they can dress to impress to accentuate your glamourious posh affair. C’mon, let’s face it, we are cray-cray for these handheld, individually wrapped little cakies. Hmm… What cupcake flavors should you choose? : As many as possible! Our cupcakes are available in an array of flavors sure to please your hankering. We’ve divided these flavors into 5 amazingly dee-licious collections: Exquisite, Chocolatier, Simplistic, Fruit Filled and CandyLand. As you peruse each collections descriptions, choose flavors that mirror your event’s theme, that reflect your style and flavors your guests will enjoy. Our cupcakes are 3”in height, adorned with 23-karat gold leaf, fresh seasonal fruit, Whiskey Bourbon caramel drizzle, chocolate dipped cacoa nibs, edible glitter, edible rose petals and flowers buds. Go the extra mile and personalize each cupcake with an edible image (additional fee). Cupcake centerpieces are great table decorations as are cupcake towers for large events including weddings. Ready to wow your guests with a out-of-sight cupcake display? CLICK HERE to view our menu and gourmet cake collection pricing. CLICK HERE to place your cupcake order or contact us at Cotton@TieredandPetite.com to get crackin’. A Classic French Confection #AfternoonTea! Petits Fours, in French, mean “little oven”. These mini layers of cake are sandwiched between house-made raspberry preserves, a rich cassis liqueur buttercream filling or tangy cream cheese buttercream. We dip each hand-cut petit four in our award winning imported chocolate glaze. To guild the lily, a white chocolate rose, butterfly, seal stamp, cameo and other engraved edible gems adorn the top of each confection. Albeit a daunting task, we take extreme care to ensure each little darling will be thoroughly enjoyed by our clients on a consistent basis. The petit four flavors we offer are: Almond Raspberry, Lemon Cream Cheese, Vanilla Cream Cheese, Chocolate Raspberry and Chocolate Cassis. These elegant petite cakes are presented as a 9-piece gift set in a lovely ribbon box. 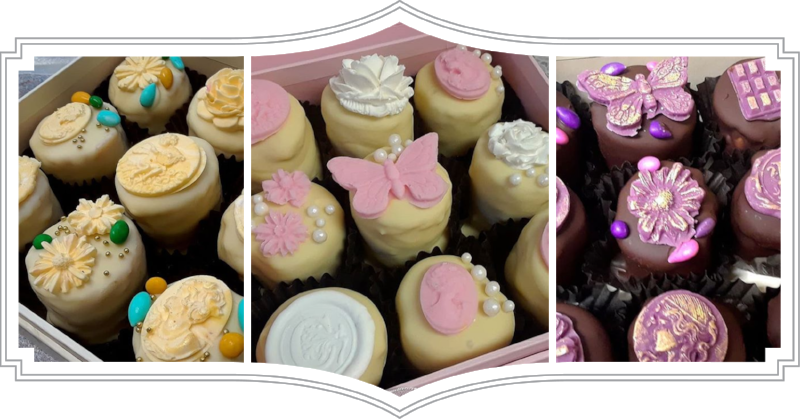 Our exquisite petits fours make excellent surprise birthday gifts, bridal/baby shower favors, tea party nibbles and holiday stocking stuffers. Let the gift giving begin! CLICK HERE to place your petit four order or contact us at Cotton@TieredandPetite.com.